Stuart Campbell is suing the former Labour leader over comments she made in a newspaper. 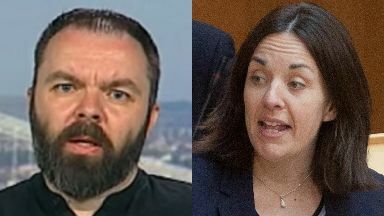 Tweet row: Stuart Campbell is suing Kezia Dugdale. A Scottish blogger has told a court he was "absolutely horrified" to have been accused of homophobia by Labour MSP Kezia Dugdale. Wings Over Scotland writer Stuart Campbell is suing the former Scottish Labour leader for defamation over a column she wrote in the Daily Record referencing his "homophobic tweets". The tweet at the centre of the dispute states: "Oliver Mundell is the sort of public speaker that makes you wish his dad had embraced his homosexuality sooner." He said it was satirical criticism of Scottish Conservative MSP Oliver Mundell's public speaking skills. Mr Campbell said the tweet was a joke, meaning: "I wish by some means or other you had not been fathered by your father." Ms Dugdale later brought up the matter at First Minister's Questions in the Scottish Parliament, where she claimed her column had "called out Mr Campbell for his homophobic comments". Mr Campbell said it was an "ironic and sarcastic reference to the prevailing culture of video gaming in general".